If your feet are in need of a little care and attention, take a look at the Foot Expertise range of foot and leg care products, available from The CHILL CABINET. Promotional Feature, contains PR Samples. Your feet take a pounding, literally, from everyday life. And your skin is the first layer of protection that the body has against external stressors. Whether you’re on your feet all day at work, spend your days running around after the children, or put in hours walking around cities and countryside, your feet put up with a lot. So it’s no surprise that the skin on your feet can often show signs of wear and damage, and needs extra special care. 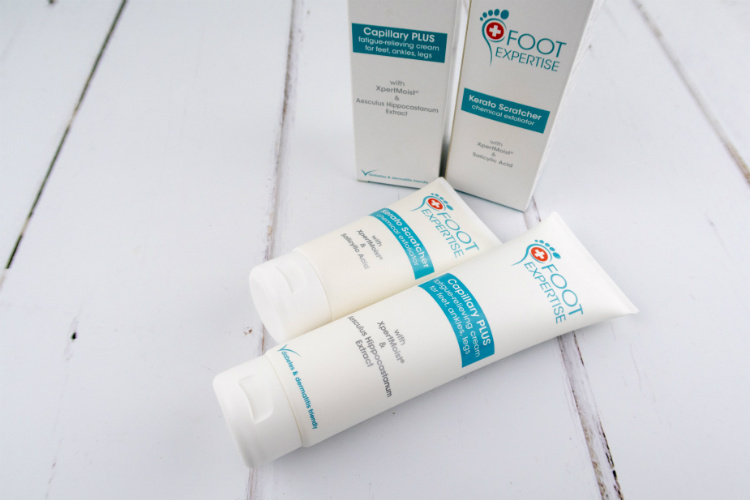 So Foot Expertise have created three ranges of products specially designed to care for your feet and legs. Unlike many foot care products, Foot Expertise products do not use urea, which can degrade through contact with heat. Foot Expertise has replaced this ingredient with their trademark XpertMoist. This is a blend of 3-amino acids and active extracts, which acts as a molecular film to deliver hydration and help the skin to heal and regenerate. Foot Expertise products do not contain any parabens, silicons, mineral oils, alcohol or artificial colours. And the fragrances used are allergen-free. This means that the products are suitable for all skin types, even if you have diabetes or dermatitis. This collection features four products designed for the daily care of your feet and legs. It includes a Cream Wash to cleanse feet and soften hard skin, and Active Care Moisturiser which hydrates and conditions the skin. Deo Refresh is a deodorant for feet and shoes, while DeStresser is a luxuriously rich hydrating mousse for legs and feet. The Specials Collection comprises three products which are designed to give tailored care for specific food and leg issues. Blister Shield helps you to avoid blisters by creating a protective film to prevent friction and rubbing. Toenail Repair is a potent blend of oils that helps to repair and revitalise unsightly nails, while Fungal SOS is an effective 2 in 1 product which relieves itching and soreness while actively helping to prevent the re-occurrence of infections. The five products in this collection help to soothe irritation and protect against common foot and leg issues. Hydra Recharge helps to nourish and moisturise very dry feet, soothing irritation and reducing the risk of fissures. For heels that are already very dry and cracked, Cracks Refiller helps to replenish, calm and repair the damaged skin. This is perfect for getting your feet ready to bare in summer sandals or strappy heels. PerspirOFF is a medicated cream which contains powerful active ingredients to reduce high sweating and help to protect against fungal infections. The final two products in this range are Kerato Scratcher, a gentle exfoliating cream, and Capillary Plus which both moisturises skin and delivers immediate fatigue relief. Foot Expertise sent me these last two products to try out, and I’ve been putting them to the test. Don’t be fooled by this product’s name. Kerato Scratcher isn’t a harsh abrasive exfoliator that will leave your skin feeling raw and tender. Instead it’s a smooth gel/cream that you apply to the skin once or twice a week. It’s easily absorbed, doesn’t have a strong fragrance, and doesn’t leave any kind of sticky residue. The active ingredients in Kerato Scratcher will gently remove the dead skin cells from the upper layers of your skin’s surface. This helps to make your skin softer and smoother, as well as making it ready to receive any further treatments that you’re planning to use on your feet. I decided to test this product by using it on just one foot, so that I can compare the difference. I have only been using this for a couple of weeks, and I do tend to get quite a lot of hard skin on my heels. But already I’m seeing an improvement in the condition of the skin on the foot that I’ve been using Kerato Scratcher on. Foot Expertise say that with regular use, Kerato Scratcher can help to reduce thickening of the skin on your heels. So I’m hopeful that by using this product, my heels will be ready to show off in strappy sandals! Foot Expertise Kerato Scratcher costs £11.99 for 75ml. This was definitely my favourite out of the two Foot Expertise products that I tried, and its one that I think I’ll be buying in the future. It’s a gel/cream that is quickly absorbed into the skin. As well as leaving your skin feeling softer, this product also helps to relieve the tired, heavy feeling that you get in your legs when you’ve been on your feet for hours. As a travel blogger, I can spend all day walking around cities or through the countryside, and I’m no stranger to that heavy, hot, tired feeling in my calves and feet. Capillary Plus instantly makes my legs feel fresher and more comfortable, and the active ingredients also help to improve micro-circulation and lymph drainage. I love how this makes my legs and feet feel, and I’ll definitely be popping it in my suitcase for my next trip. Foot Expertise Capillary Plus costs £13.49 for 150ml. I’ve been really impressed by the Foot Expertise products that I’ve tried. The range is definitely well worth checking out if you want beautifully conditioned feet, toes and legs all year round! Foot Expertise products are exclusively available in the UK from the CHILL CABINET online.